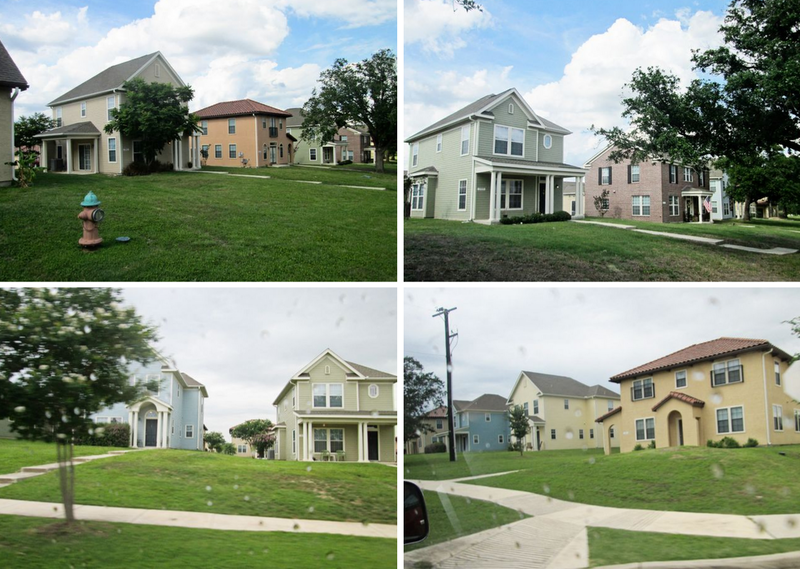 Not bad digs for the Army. 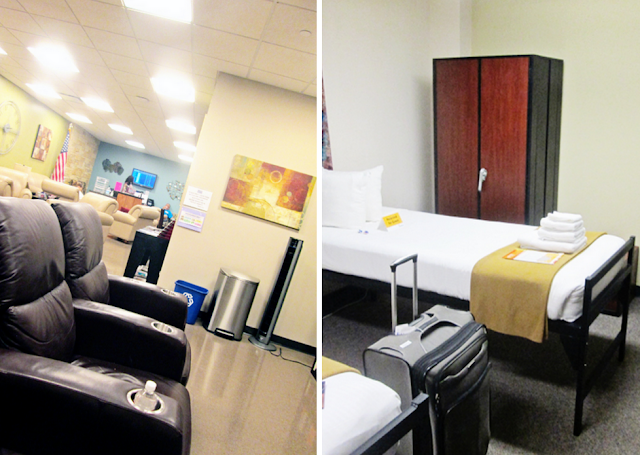 The "hotel" felt like college dorm rooms at an only slightly run down university. The first couple of days consisted of hours upon hours of in-processing, training briefs, and other presentations. 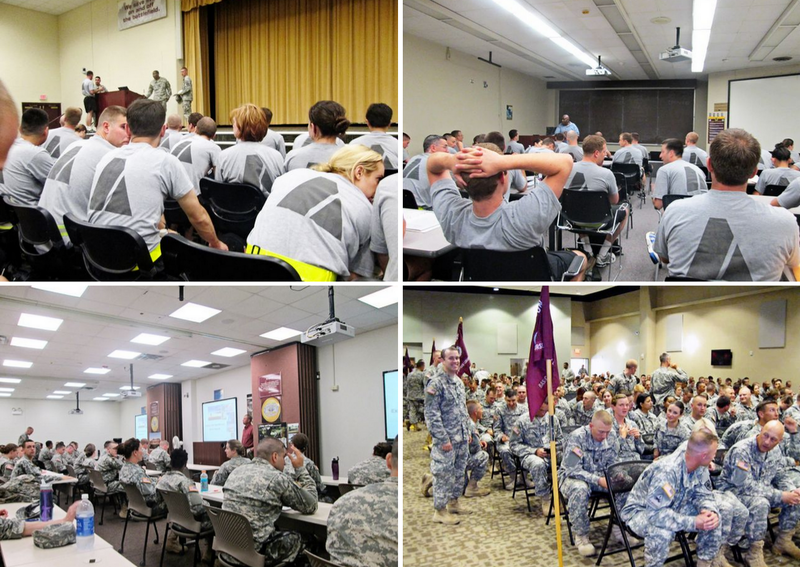 Some Army training schools are called "Death By Powerpoint." Women love a man in uniform (true!)... even if the physical fitness uniform shorts are uncomfortably revealing. On post, the food wasn't too bad. There were always a lot of options so if you didn't like the hot meals, you could always have cereal or a sandwich. But, between the three or four entree options, something edible was usually present. Ft. Sam Houston is a medical training base, and pretty small. There are some really nice on-post houses though. A fully stocked commissary. This is one of the best benefits of a military base. Food is cheap! E.g., Vitamin Waters were only $0.89! On Sundays, the AMEDD (Army Medical Department) chapel hosted various religious services. The LDS service was at 1300 and had a nice group attending. The Branch Presidency was nice enough to make sure all the new LDS military members had a set of military scriptures. I'm never going to carry a full size scripture set again! After a long, but unstrenuous weekend, the real work of BOLC began. Monday morning at 0430 we had our first PT test. 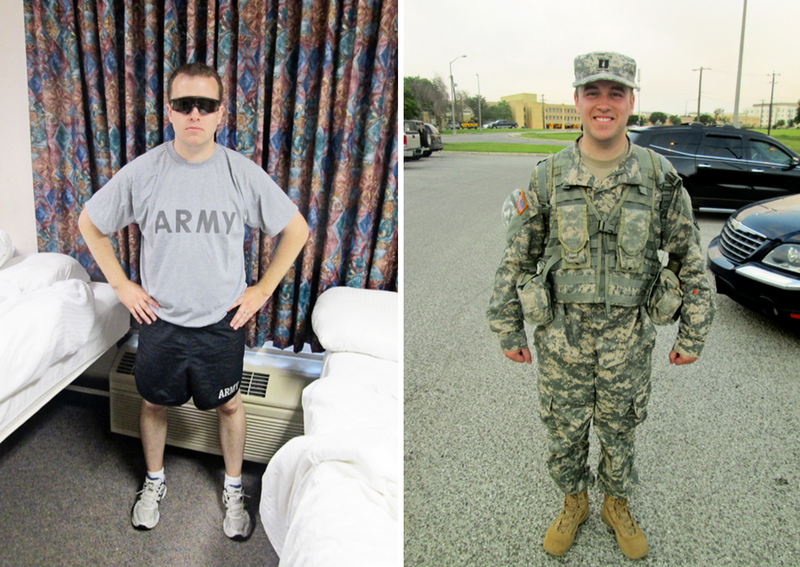 The Army PT test consists of three parts: sit-ups for two minutes, push-ups for two minutes, and a two-mile run. There are sliding scales based on age and you must achieve the minimum score of 60 in all three sections to pass. My three months of training in California paid off and I passed, even doing my best recorded two-mile run time. In the swampy Texas air, I was pretty happy with it. After showering, packing, almost being shot by a madman (long story), and being issued our weapon, an M16, we loaded up on buses and headed out to Camp Bullis, a training area just outside San Antonio. Our TTB, tactical training base, and home for the next two weeks of BOLC. Each tent housed about 30 guys. We all lived out of our one issued duffle and slept on cots. After the first night when I don't think anyone got more than two hours of sleep, tent life wasn't too bad. People settled into a routine and the cots were a welcome sight after hours out and about. While at the camp, at least one meal a day was an MRE, Meal Ready to Eat. If you've never experienced an MRE, the novelty of it makes the experience fun the first time. After that, you just eat so you don't collapse from heat exhaustion. Tip: Anything with marinara sauce is a good choice. It tastes just like Chef Boyardee. You could never drink enough//The dental emergency kit. I think it included floss and toothpicks. 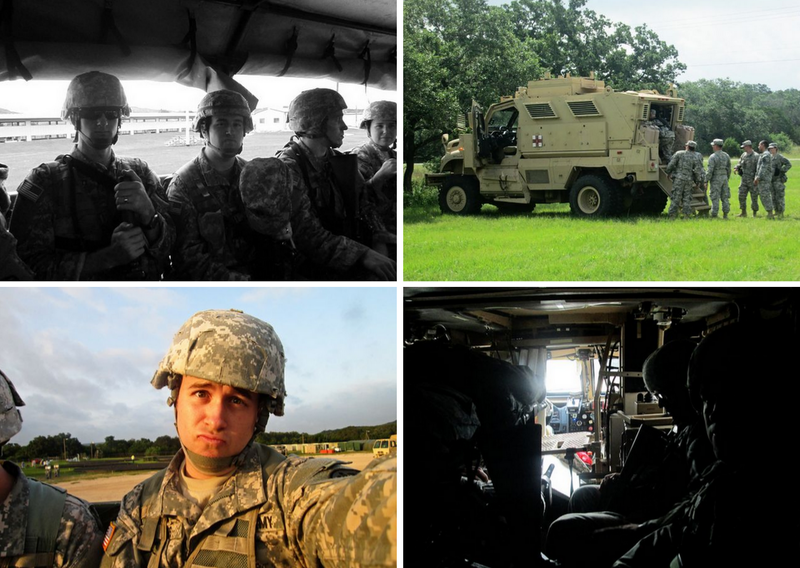 To get to the various training locations at Camp Bullis, we would load up in troop transport trucks. 16 people on the side benches, with 4 people sitting on the floor in the middle. Some army vehicles are cooler than others. 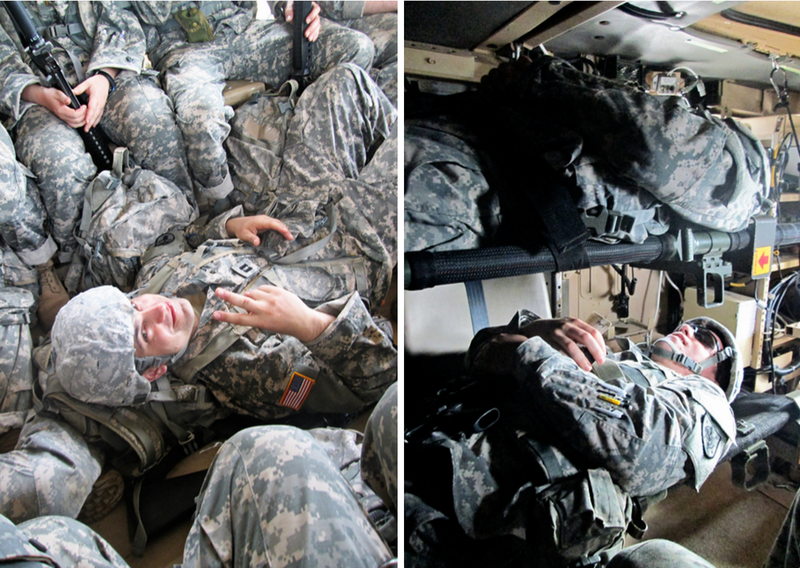 Comfort isn't always the first priority for Army transportation. The guys on the left are strapped to stretchers in the back of one of the medical evacuation vehicles. Sitting in the transport//Learning how to load casulties in an MRAP//In the army now//Playing the part of a casulty in the back of the MRAP. One of the skills we had to learn at BOLC was land navigation. 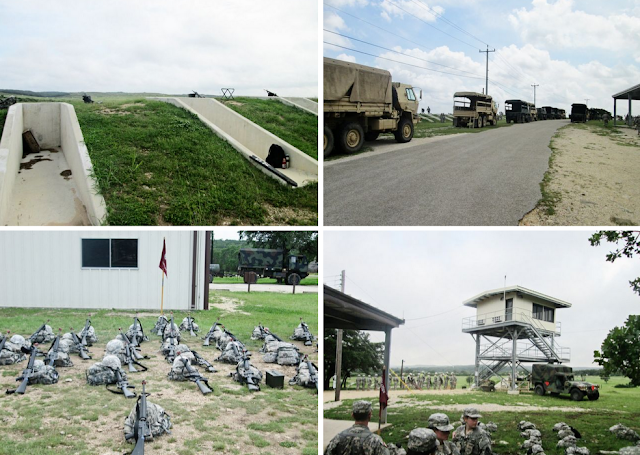 After a little classroom time teaching us the basics of map reading and compass use, we got to put our skills to the test out in the wilds of Camp Bullis. The land navigation course was about four square kilometers near our TTB. The terrain was hilly with areas of clearings covered in yucca and prickly pear or dense wooded areas. Tromping through the woods. You're only lost if you end up in the motar testing area. Dispersed throughout the land nav area were these orange pyramidal markers on stakes about five feet high. Each marker had a call sign, Golf 2 below, and a little punch that you would mark your score sheet with to prove you actually made it to the marker. After a morning of practice, they assumed we knew what we were doing and ready to be tested. Our land navigation test later in the week stared at 0400 and each pair was given eight grid points to locate and then return to camp by 0800. A score of 4/8 was a "go." My partner and I got a very respectable 6/8. Hooah! 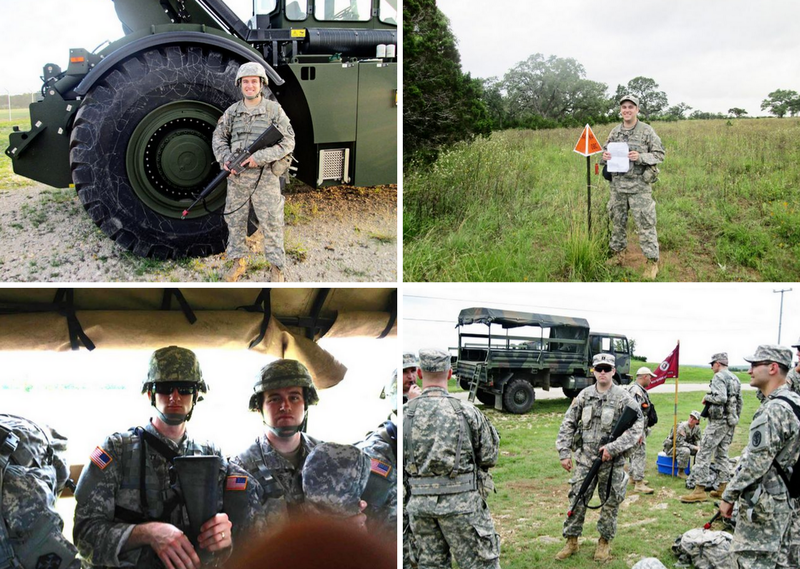 Along with land navigation, a big chunk of our first week at the camp was spent in firearm training. 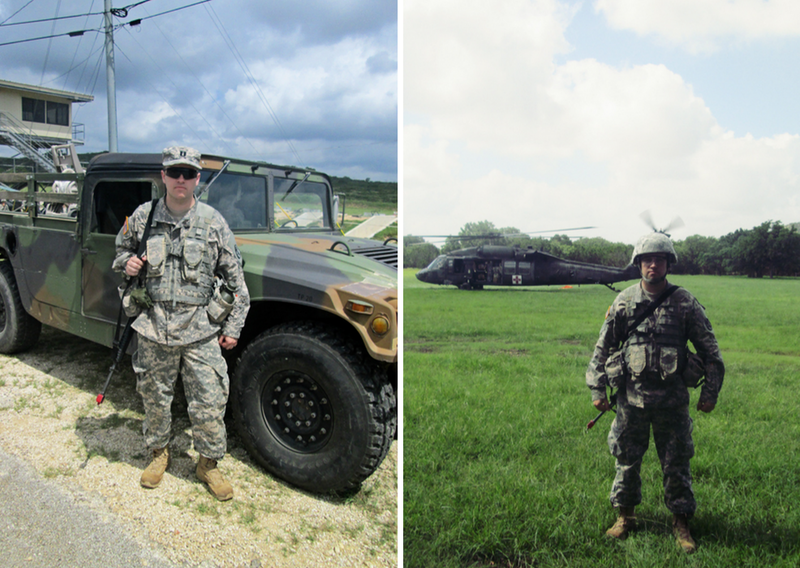 We learned to disassemble, inspect, clean, and reassemble an M16 and an M9 as well as clear and perform function checks on both. Then, after short classes on the basics of shooting, we headed to the range. The first day of shooting we zeroed our rifles, making sure the sights were pointing where the bullets were going. 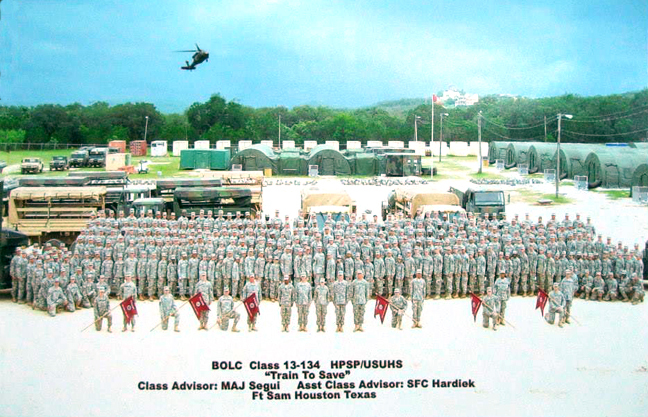 Then the next day we got to qualify at a 300 meter pop-up target range. I had never shot at pop-up targets before, but it was a lot of fun. It was much more entertaining to hear the "ping" and then see the little silhouette fall back down than just punching holes in paper targets. 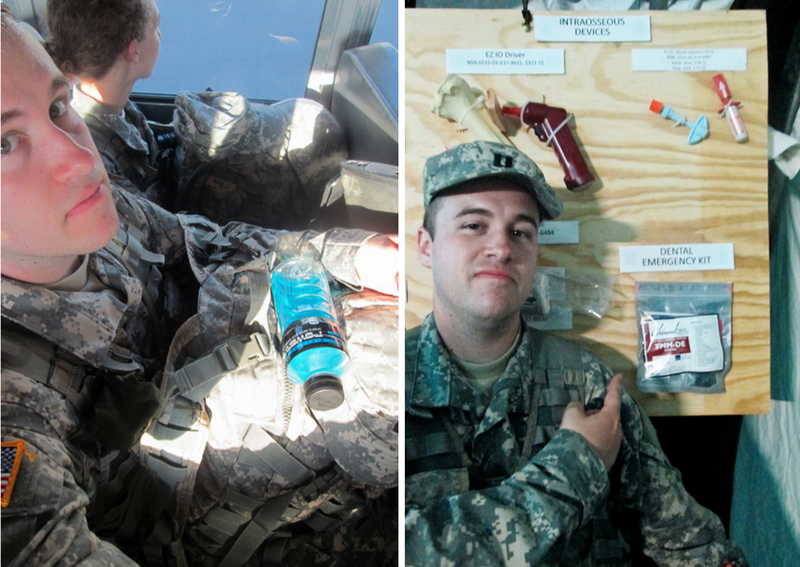 Our second week at Bullis focused on the medical aspect of Army field life. We learned about the 4 roles of army medical care, from the front line mobile aid stations to the large fixed hospitals like Landstuhl, Germany. This photo is of a role 2 facility, one capable of triage, emergency, surgery, and sometimes even radiology and dentistry. More practice learning to load various Medevac vehicles. Our group was smart, we picked the smallest girl in our group to be our patient. 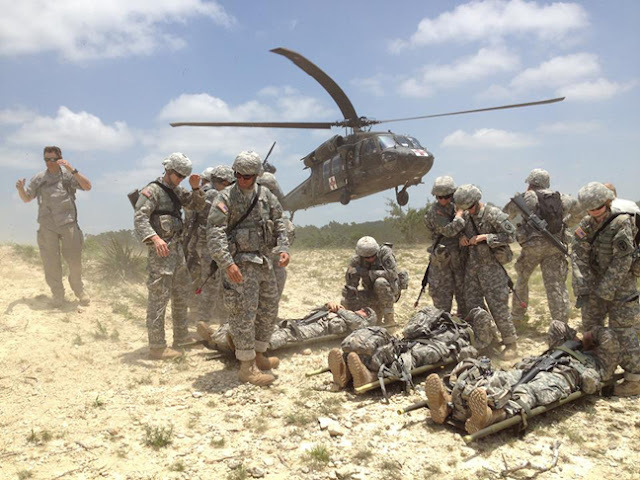 One of my favorite parts of the training was that during the three days where we rotated between role 1, 2, and 3 level care facilities, a Blackhawk medevac helicopter was part of the training. "Casulties" for a role 1 unit where loaded up into the "bird" from one area of the camp and flown to a role 2 tent where they would be unloaded and then patients from the role 2 would be loaded up and flown somewhere else on the camp to our role 3 hospital. I wasn't one of the patients that got to ride on the helicopter, but I got to run a stretcher out there in the rotor wash and load it up a couple times. Pretty cool to see that thing come in for a quick landing, get loaded up, and take off in a flash. This is one of the coolest pictures anyone got at BOLC, taken by one of my buddies. 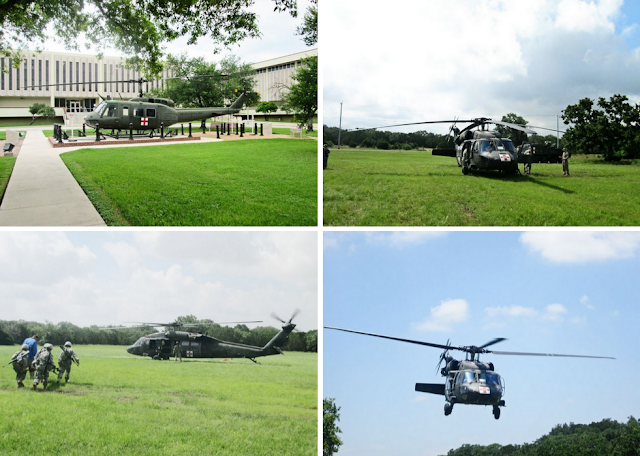 This is the bird coming in to medevac casulties from one of our role 1 forward aid station landing zones. After two weeks up at the camp, more or less sweating the entire time, even in the shower, we returned to Ft. Sam. My roommate found a (thankfully dead) stowaway in his duffle when he dumped it out to unpack. During our last week at BOLC, we spent time with our various departments. 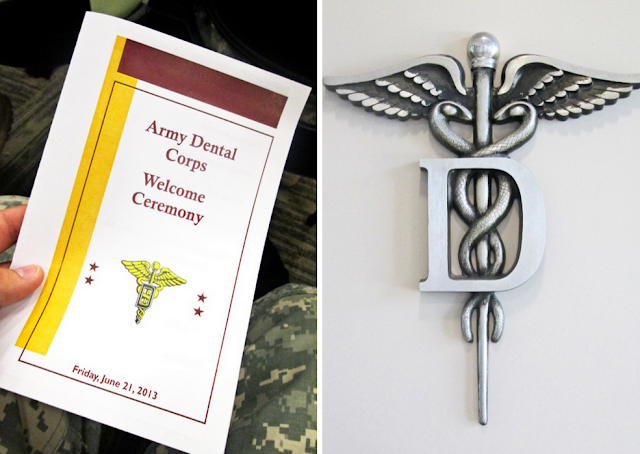 The Dental Corps had a nice induction ceremony for us. The newest members of the Army Dental Corps. I'm in the third row, fourth from the right. One of two dental clinics on Ft. Sam Houston. After our ceremony, the Dental Corps commander held a dinner and reception for us at the AMEDD museum on base. 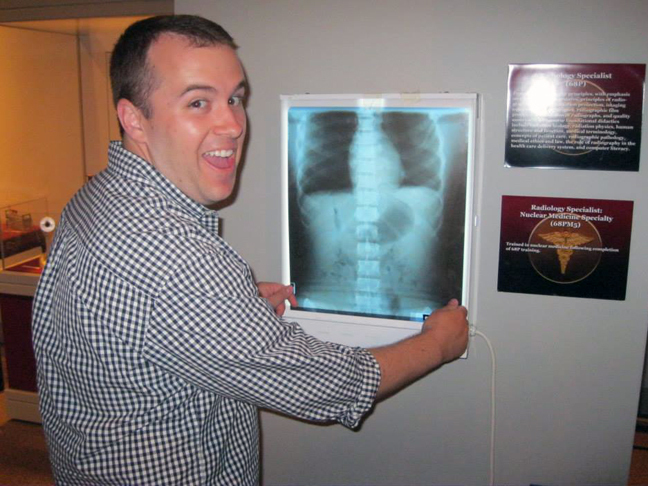 Reenacting the title sequence of Scrubs in the museum. An exhibit in the museum. 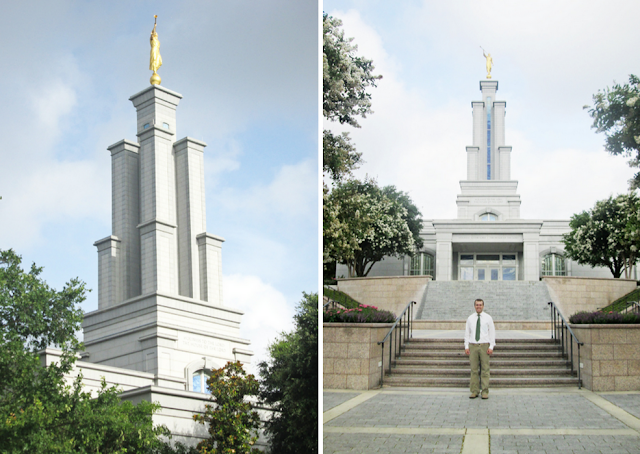 One of the best things I got to do in San Antonio was to go to the San Antonio temple for a session. The branch on base organized the trip for us during one of our free Saturdays and there were about 30 LDS soldiers that went, 90% of whom were BOLC students. The San Antonio temple had a lot of stained glass windows and doors throughout which was really cool. Overall BOLC was a pretty interesting experience. A lot of hurry up and wait, but also a lot of good training. I am excited to get to Germany and get back to dentistry. Wow!! Great pics!! That's crazy about the gunman!! Great photos. It was very insightful. What is it with these gunmen?! There was the one in Ft. Hood a few years ago as well. So cool! I'll have to make sure Dan sees this to help prepare him for next year! Thanks for sharing your story and for your service! I hope you got some puffy tacos while you were in S.A. Awesome! Thanks for documenting! :) It's fun to think of what Blake might be doing! WAY to go Chris--this was SO enlightening--thank you for your service! Thanks for sharing Paige and Chris. My brother is in the Army. In Africa right now. I'm going to share this with him.